The flute chosen by Martha Long! Martha Long, Principal Flute of the San Antonio Symphony Orchestra, attended the NFA 2014 convention in Chicago with one intention: to purchase a new flute. After trying a huge array of instruments, she chose fifteen finalists, and through the gracious help of Carolyn Nussbaum, we found ourselves in a private room, listening to the same orchestral excerpts over and over again on those flutes. I taught Martha for seven years during her teens. Martha asked me to listen, along with her flutist friends Matthew Roitstein and Ben Smolen as well as a pianist friend, so I happily spent most of this convention hearing her play the same orchestral excerpts over and over. We narrowed it down to four instruments, but I wasn’t fully satisfied. Martha sounds good on any flute, but I wanted her to sound spectacular. So I practically pushed Carolyn out into the hotel hallway, and said, “Don’t you know of some fabulous instrument, something that will be even better than those she’s playing now?” I knew that Martha’s flute was to be a gift from her parents, and they had impressed upon me that they wanted the very best for Martha. Carolyn energetically pointed her index finger up in the air, saying, “Wait!! I’ll be back in five minutes!” ---- and whoosh! ---- she ran off down the hallway. I casually wandered back to my seat in the room, and when Carolyn returned, she had another instrument to add to the mix. We went through yet another round of testing. I didn’t know how Martha had the stamina. No one, including Martha, knew what brands we were hearing. And then ------ one flute stood out so far beyond the others, it was clear beyond doubt. “What flute is this?” we all wanted to know. Mary Lyons, a flute specialist who works for Carolyn, had been ably assisting us, and announced it was a very special Powell flute. 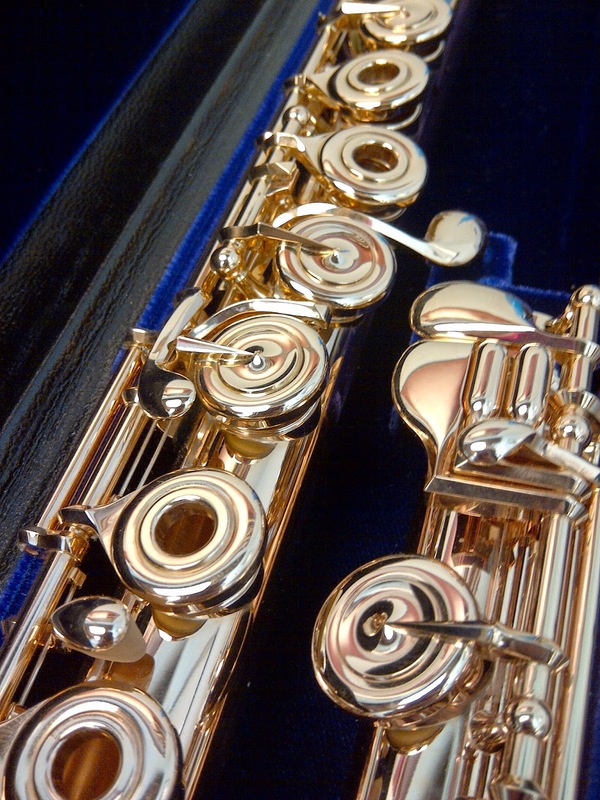 Carolyn had known about the existence of this specific flute since the Spring and brought the instinct, knowledge and experience of her many years in the business to believe this would be right for Martha. Martha sounded amazing: as amazing as she always humbly describes her colleagues and friends as sounding. Well, then, which instrument will help you meet these goals? And gradually, along with speaking to the Powell staff, Martha embraced the idea that she could allow herself to fall in love with this flute. My husband met us at the airport and we drove Martha to her parents’ home. We stayed at the car so Martha could have a moment with her parents. She walked into the house and we could see her parents’ mouths drop open in utter shock. “What are you doing here?” exclaimed her mother. Her father was simply speechless. At that point we were invited in, and watched Martha show the flute to her parents. She played Bach. The joy and love between them was a pleasure to see. Oh, except for Martha’s cat, Lola, who was staying with her parents and doesn’t care for Bach. Martha is now playing on her Powell gold flute in the new Tobin Center for the Performing Arts in San Antonio. The orchestra members and music director are all thrilled with Martha’s new instrument. She is giving a recital in December presented by Camerata San Antonio, and I will fly there to attend. This time she is going to surprise me, she said, with her dress. I wonder what that might mean! Maintaining such a close relationship with a former student, one who is as kind, considerate, and fun as Martha has brought me more joy and satisfaction than I can describe. Helping, even in the smallest way, to find her way to this Powell flute, was a rich experience. Except for previously contributed articles to the Powell blog, having a few students purchase Powells through Carolyn Nussbaum, and being acquainted with Powell’s friendly staff, I have not been associated with Powell previously. Thank you to all the wonderful people who were a part of this story: Martha Long, Janet and John Long, the staff at Carolyn Nussbaum Music Company, especially Carolyn Nussbaum, Mary Lyons, and Carolyn’s mother Shirley, the staff at Verne Q. Powell Flute Company, Martha’s friends, and, as always, my chauffeur and husband Fred. Helen Spielman is a performance anxiety coach who taught flute for 24 years. Her passion is to help musicians maximize their highest potential on stage. She teaches positive self-talk for performance, self-compassion, the alleviation of perfectionism and worry about others’ approval, concentration, and consistent performance. Helen works with musicians, moms, and business executives internationally via Phone and Skype. Her popular book A Flute in My Refrigerator: Celebrating a Life in Music is selling prestissimo and is available on Amazon as well as at flute specialty stores. Please visit http://PerformConfidently.com for more information.